New Delhi, July 31, 2018:“The District Mineral Foundation (DMF) scheme is a people-centric vision of natural resource governance where people’s right to benefit has been put at the forefront. If developed and implemented well, DMFs not only have a huge potential for improving the lives and livelihoods of some of the poorest communities, they could also be a model for inclusive governance,” Sunita Narain, director general of Centre for Science and Environment(CSE),said while releasing CSE’s 2018 assessment report on the scheme here today. 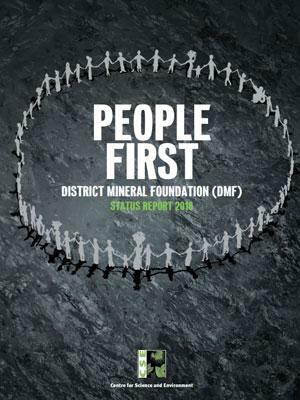 People First: District Mineral Foundation (DMF) Status Report, 2018, as the assessment is titled, comes as the DMF scheme enters the fourth year of its functioning. CSE has assessed its effectiveness through an analysis of DMF administration in 12 mining states in the country. An in-depthanalysis has been done of the investments in 13 districts in the five top mining states of Odisha, Jharkhand, Chhattisgarh, Madhya Pradesh and Rajasthan. These five states account for more than 72 per cent of the total DMF accrual in the country. Established as a non-profit Trust, DMFs in every mining district have the precise objective to work for the interest and benefit of persons and areas affected by mining-related operations.The assessment report,which is an independent review of the performance of DMFs in various mining states and districts of India,was released today in New Delhi, where representatives from the state and Central governments, district administrations from mining-affected districts, NGOs and the media participated. “DMF provides a defining opportunity to overturn the decades of injustice meted out to the millions of people living in deep poverty and deprivation in India’s mining districts. But DMF can only deliver if it is implemented in the letter and spirit of the DMF Rules under the Mines and Minerals (Development and Regulation), Amendment Act, 2015. Our assessment shows that so far, states have failed to implement DMF in the right spirit,” said Chandra Bhushan, deputy director general, CSE. None of the DMF Trusts have identified its beneficiaries -- the mining-affected people. “The law clearly mentions that the focus of DMFs is both mining-affected people and mining-affected areas. Therefore, DMFs should identify both and makeinvestments accordingly,” said Bhushan. “By not identifying the mining-affected people, DMFs have completely missed out benefitting some of the worst-affected people – those displaced due to mining operations and also those who have lost their livelihoods and their traditional rights over the land being mined,” added Bhushan. DMF administration in most states is dominated by bureaucrats and political representatives. Some states are now making the situation worse by increasing the political hold, shows the CSE report. “For instance, Telangana, in June this year amended its DMF Rules to include all MPs and MLAs in the DMF body of respective districts. In fact, in doing so, the state has completely removed any scope of Gram Sabha representation. DMFs in Telangana districts now have only a single body -- the DMF Committee -- with only officials and politicians who will decide on all works that DMF should undertake,” said Srestha. In several states, the governments are intervening in DMF investments, says the CSE report. For example, the Chhattisgarh DMF Rules has created a “Settlor”-- the Secretary of Mines -- who has over-riding powers to include or scrap a project.In Jharkhand, the state government in October 2016 had given almost a blanket direction to DMFs to focus on two issues -- piped water supply and sanitation. “Such top-down intervention is against the intended autonomy of DMFs,” says Srestha. It has also limited the scope of DMFs to plan and invest on the most pressing needs in some of the districts. “A classic case is Jharkhand’s West Singhbhum district. With the focus to spend on drinking water and household toilets following state directions, the district has failed to make the necessary investments so far to improve the situation of malnutrition and mortality rates among children below five years,” adds Srestha. West Singhbhum has an under five mortality rate (U5MR) of 96, and a high malnutrition rate with 63 per cent children in the same age-group growing up stunted -- one of the worst records in the country. Lack of planning is one of the biggest drawbacks of DMFs in most districts, says the report. “In the absence of proper planning, DMF sanctions are often misplaced,” says Bhushan. For example, many of the top mining districts, particularly with high tribal populations, are under the national radar for high U5MR and malnutrition among children below five years. These include Keonjhar and Sundargarh (Odisha), West Singhbhum (Jharkhand), Singrauli (Madhya Pradesh) etc. However, none of the districts have really sanctioned anything to address this. “If DMF investments were properly planned considering people’s needs, child nutrition would be one of the key focus of investments everywhere. It is completely unacceptable to have high mortality rates and poor nutritional indicators among children in districts having an enormous corpus like DMF,” said Bhushan. In many cases, people and areas worst affected by mining have also been left out. In Dhanbad, the biggest mining-affected area, Jharia, has been kept out of the scope of district’s DMF sanctions. “The area is infamous for the deplorable living conditions of its inhabitants with no livelihood opportunities but to pick coal, sustained exposure to burning coal, poor access to healthcare and lack of clean drinking water. It is really a pity that not a single rupee out of Dhanbad’s Rs 935 crore DMF sanctions has gone to Jharia,” says Srestha. DMF funds are also being diverted for urban projects, which have nothing to do with priorities of mining-affected areas and communities. For example, “In Odisha’s Jharsuguda district funds are being diverted for electricity supply to an airport; in Korba, Chhattisgarh, the DMF fund is being used for work under AMRUT, construction of multi-level parking lots in the town, convention centres, bus stops etc,” points out Srestha. Overall,DMF investments are heavily focused on construction activities in all cases. Emphasis on improving the Human Development Indicators is minimal. For instance, there is very few initiative towards making many of the existing facilities – such as health centres, schools etc – functional. What is hampering planning is the absence of a proper administrative set-up. The report finds that except for a handful (out of 50 districts reviewed, only three have this), no DMF has yet setup an office for planning and coordination, engaging concerned officials and experts. DMFs are operating in an ad hoc manner with intermittent meetings of DMF bodies where decisions on sanctions are being made. Some districts (as in Odisha and Jharkhand) have engaged private consultants to oversee DMF implementation. As a people’s institution, DMFs must remain transparent and accountable, emphasizes the CSE report. Public disclosure of information is key to this. However, except for Odisha and Chhattisgarh, no state has a proper DMF website so far. The other important factor is DMF audits -- this has also not happened for most DMFs so far. Even for the few districts where it has happened, such as in Chhattisgarh and Odisha, so far financial audits have only happened once. There has been no performance evaluation or social audit, essential components for public schemes. State governments must provide districts the flexibility to plan and invest on the needs of the local communities. The intended autonomy of DMF Trusts should be maintained. A systematic and bottom-up planning approach must be followed to make investments effective. The potential can also be improved by considering convergence with other programmes of the Central and state governments once priority issues are determined. Districts must identify DMF beneficiaries; there cannot be a Trust without beneficiaries. This will also help in targeted investments such as for addressing women and child development issues. Gram Sabhas (and ward members where applicable) should have a representation in the DMF body. Not following this is in contravention to the spirit of the DMF law as well as the state DMF Rules. For efficiency of operations, all DMFs must have an office comprising of officials and experts. Independent organizations/planning experts can be roped in from time to time for effective planning. Public disclosure of information is key to DMFs’ transparency of operation. District-specific DMF-related information must be made available through a website. To ensure access, information should be shared by using panchayat-level platforms. “As we enter the fourth year of DMF implementation, it is time we sort out the planning and implementation issues. Without bottom-up planning and proper institutional structure, DMF will not be able to deliver. We need the involvement of the beneficiaries in planning and monitoring, to make DMF transparent and accountable. Let this be the agenda for the coming year,” summarised Chandra Bhushan.